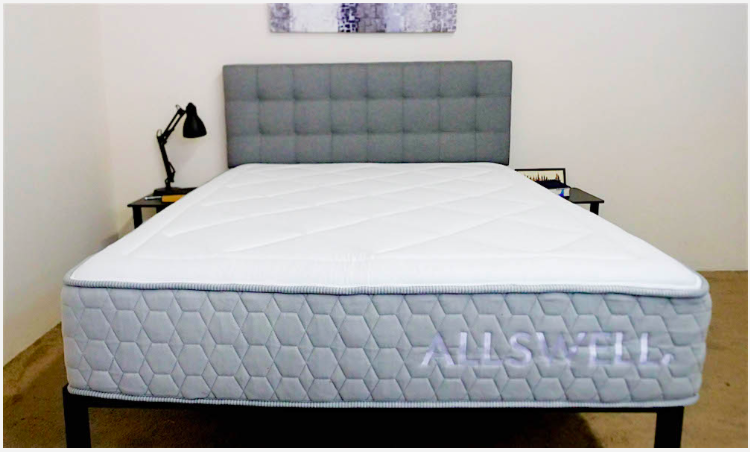 Allswell vs Saatva Mattress Comparison - Which Is the Bed for You? I am beyond stoked about today’s comparison because I’ll be pitting two fierce coil-centric mattresses against one another. In one corner, we find newcomer Allswell, primed and ready after a successful launch earlier this year. And in the other, industry vet Saatva, a resilient pioneer who’s been shaking up the online bedding game since 2010. Will Saatva KO Allswell with its double coil system? Or will Allswell throw a memory foam right hook that leaves its opponent quaking in the dust? Trust me folks, this is sure to be a heavyweight match-up the likes of which we’ve yet to see here at Sleepopolis. Think you can handle it? Read on to find out, or click here to skip to my review summary! For the purpose of this comparison, I’ll only be looking at the Allswell Luxe Classic, Firmer and the Luxury Firm Saatva. Before we get into all the stuff that makes these beds so different, let’s take a minute to talk about their similarities. While it’s true that both brands offer their own special take on the direct-to-consumer bedding trend, they share some surprising traits. Use of Coils – As should be obvious from my intro, these beds implement coils for support. While the Saatva’s an innerspring (featuring a double coil structure separated by a thin layer of foam) and the Allswell’s a hybrid (outfitted with a single pocketed coil system overlayed by thicker layers of foam), the use of coils imbues both structures with some buoyant lift. Multiple Firmness Options – These mattresses also come in multiple firmnesses. There are currently two versions of the Allswell Luxe Classic, a softer all-foam model and a firmer hybrid, which I’m focusing on today. And the Saatva comes in three different firmness levels: Plush Soft, Luxury Firm and Firm. For both brands, the variety is meant to make the beds more accessible to a wider range of sleepers. Price – While we’ll definitely be exploring price more in depth later on, I did want to acknowledge that these beds are pretty evenly matched when it comes to cost. A Queen size Saatva, for example, retails at $999 while an Allswell Queen comes in at $855. Now that we’ve got the similarities out of the way, let’s turn a magnifying glass on these puppies and see what characteristics contribute to their distinct constructions. I’m going to walk you through a brief synopsis of each bed’s specific build below, but would encourage you to also check out our full reviews of the Saatva and Allswell. Cover – Made from 100% cotton, the Saatva cover is soft and breathable. It’s also quilted with a bit of foam, creating a sort of Euro-style pillow top. Comfort Layer – Beneath the quilted cover lies a convoluted layer of foam that provides the sleeper with even more pressure relief. The wavy design also encourages airflow throughout the structure. Compression Layer – Up next, you’ll find the first section of pocketed coils. This layer brings some great bounce to the bed, helping to position the sleeper on top of the mattress. Since these coils are individually wrapped, they also work to isolate motion. Edge Support – Wrapped around the second pocketed coil system is a layer of edge support made up of durable foam. This section expands the usable surface area of the structure, allowing you to sleep all the way to the side. Support Layer – And finally the layer of steel coils, which gives the bed most of its bounce and support. This is a tall section, which not only contributes to Saatva’s impressive profile (14.5”!) but also allows for some nice airflow to keep things cool. Cover – As in the Saatva, the Allswell cover is quilted with foam, but with much more of the stuff, namely 3” of both memory and super soft foam. 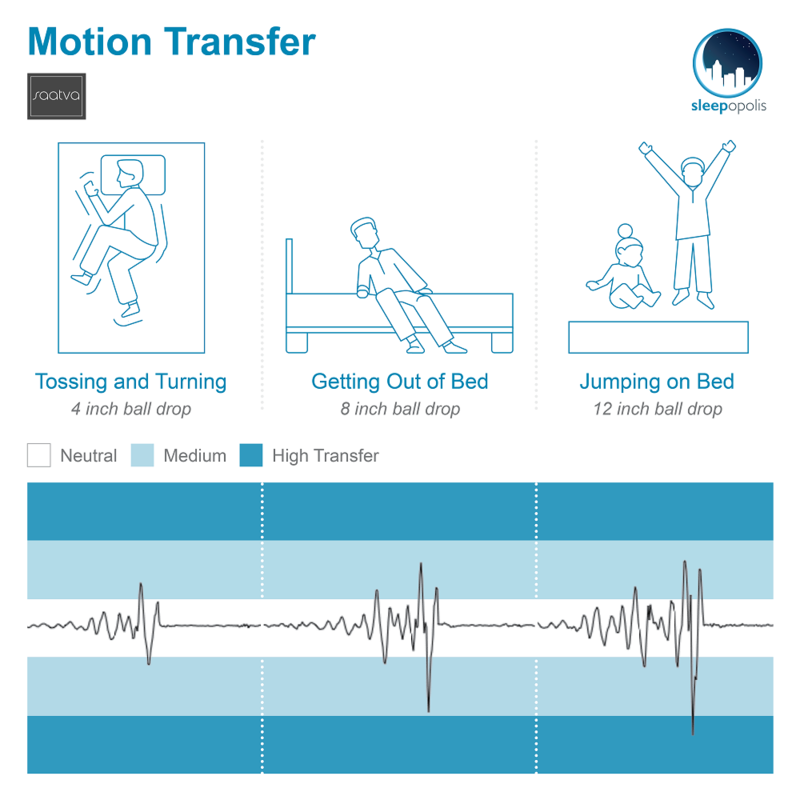 This combination provides the sleeper with immediate pressure relief. 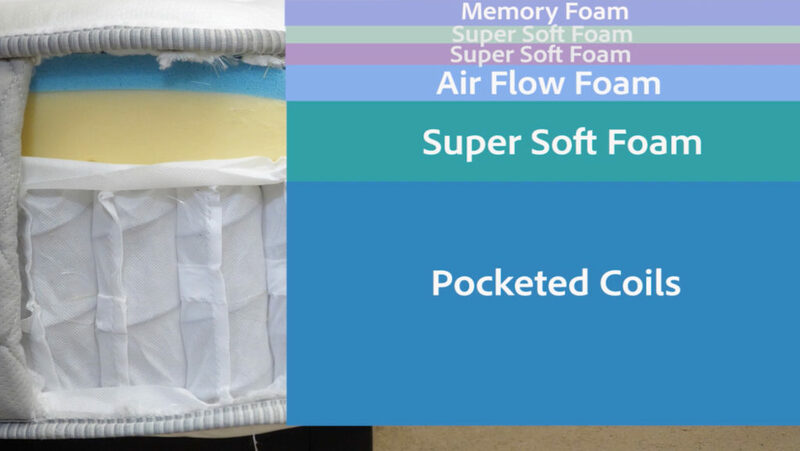 Comfort Layer – Beneath the plush cover, you’ll find an inch of Airflow Foam, which is similar to memory foam in that it has a slow response to pressure, producing some pleasant sinkage and contouring. However, unlike memory foam, this material is breathable and excellent at dispersing body heat. The biggest thing I’m noticing—and hey, maybe you caught it too!—is that though both beds employ springy support, they do it in really different ways. While the Saatva doubles down on the bounce with a coil-on-coil design akin to a traditional innerspring, the Allswell features a pretty even split between its foam and pocketed coil layers, creating a bounce that’s a touch more subtle than the Saatva’s. Speaking of foam, did you catch the memory foam in the Allswell? 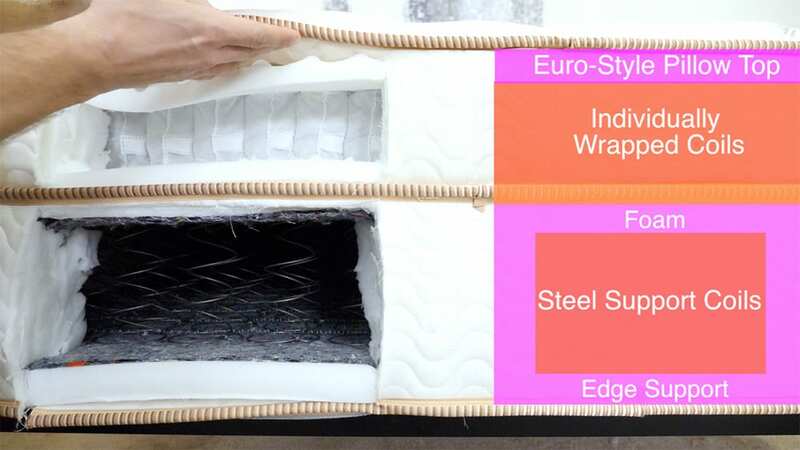 This could be a game changer for any of you out there who want pocketed coils, but don’t want to give up all the pressure-relieving goodness of the classic mattress material. We’ll explore how this difference contributes to the beds’ divergent feels below. Construction specs aside, let’s get into how these mattresses feel. While feel is always going to be a personal thing, I’m going to try my darndest to break down all the various aspects that contribute to these beds’ unique vibes. Everyone feels the firmness of a mattress differently because of size and weight distribution, so I brought in three more testers to try out each of these beds. Below is the graph showing the average firmness rating for each of the mattresses. My testers were pretty much in agreement about the firmness of the Saatva, giving it an average firmness rating of 7.1. 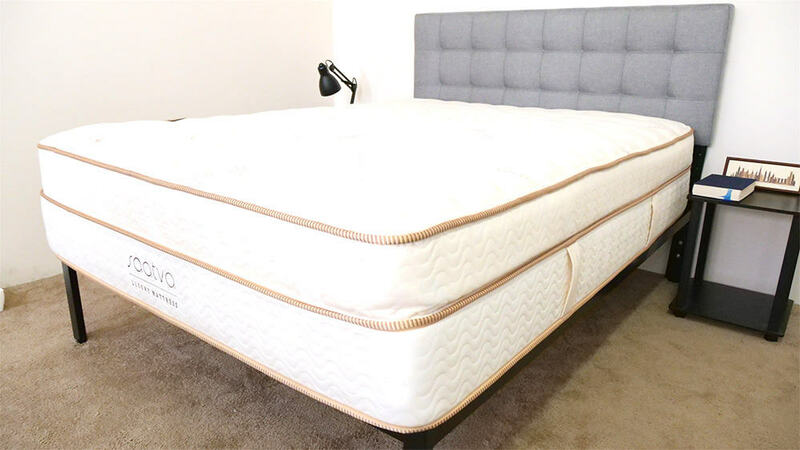 When compared to the industry standard of 6.5 for medium firmness, it’s clear that this bed is fairly firm. I personally gave the mattress a 7, finding its coil-on-coil construction created a feel that was a touch above medium firm. 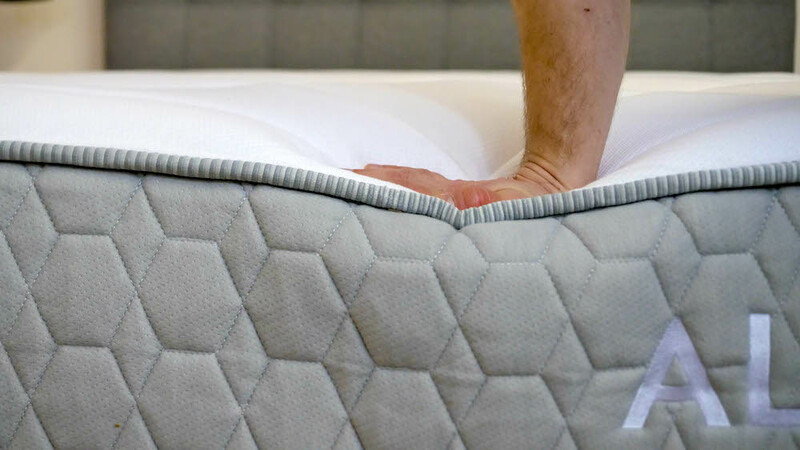 While you do get a bit of pressure relief from the foam quilted into the plush cover, the coil systems do an excellent job of positioning the sleeper on top of the structure, mitigating any sort of stuck-in-the-bed sensation. While the firmness here is going to work well for back and combo sleepers, strict side sleepers may find that the bed doesn’t provide enough cushiony relief to the shoulders or hips. But never fear! Remember that the Saatva also comes in a Plush Soft version. And if you’re a stomach sleeper who needs an ultra-supportive structure to help keep your spine in a good alignment, you may want to consider the Saatva Firm. As far as edge support is concerned, Saatva features incredible support across the entire surface area of the bed. While this is good news for all sleepers, it’s especially great for couples who need to maximize their usable space. My testers ended up responding similarly to the Allswell, giving it an average rating of 6.9. As with the Saatva, this marks it as a fairly firm bed. This bed is a solid 6.5 for me, as I felt its soft foam layers and individually wrapped coils worked to create a balanced medium firm feel. Unlike in the Saatva, once I lied on the bed for a moment, I could feel myself slowly sinking into the Airflow foam, which made it slightly difficult to change positions. We’ll discuss this later on, but if you don’t enjoy the feeling of sleeping “in” your bed, the Allswell may not be a great fit for you. Overall though, I’d say that the memory foam up top makes the Allswell a slightly better bed for side sleepers than the Saatva. However, this foam may not create the most ideal feel for stomach sleepers as it causes the hips to sink in for an uneven spinal alignment. Scooting close to the edge of the mattress, I felt a lot of fantastic support. 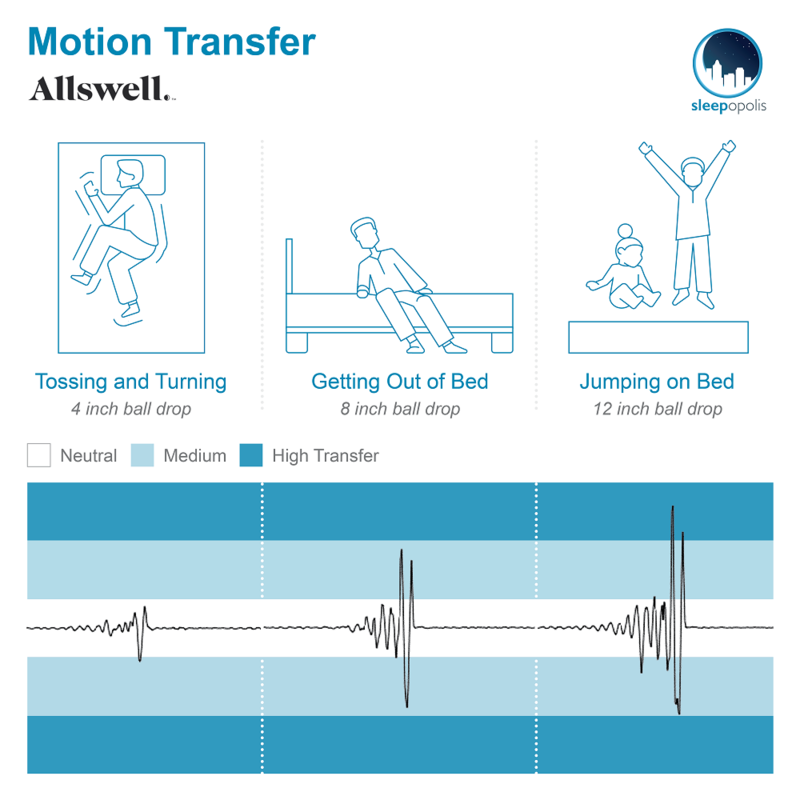 This tells me that you’ll be able to use the entire surface area of the Allswell, which could be a big plus for those of you who need to share your bed with a partner. Interestingly enough, the Saatva featured slightly more sinkage than the Allswell, which I wasn’t totally expecting given the “stuck” feeling I experienced while lying on the Luxe Classic. But as I mentioned above, this really has more to do with memory foam than it does with the bed’s actual sinkage. While both beds benefit from the motion-isolating properties of their respective pocketed coil systems, I’ve got to give a slight edge here to the Allswell. The addition of memory foam in the top layer really helps to dampen disturbance across the surface. That being said, these are bouncy mattresses, so you are likely to feel your partner’s movements in the night. When we first started this comparison, I’ve got to admit, I thought these beds would have almost identical feels. I mean, c’mon… they’ve got coils, feature tall profiles and are specifically designed to be medium firm. However, upon closer inspection, I was pleasantly surprised to discover just how different they are. For one, I found the Saatva to have a more energetic bounce than the Allswell. Don’t get me wrong, they’re both bouncy, but the memory foam in the latter really does temper its springiness. This memory foam also made me feel more “stuck” in the Allswell than I did in the Saatva, which could make a big difference for those of you who 100% want to be positioned “on top” of your bed. As a quick reminder, I’m only talking about the Allswell Luxe Classic Firmer and Luxury Firm Saatva here. 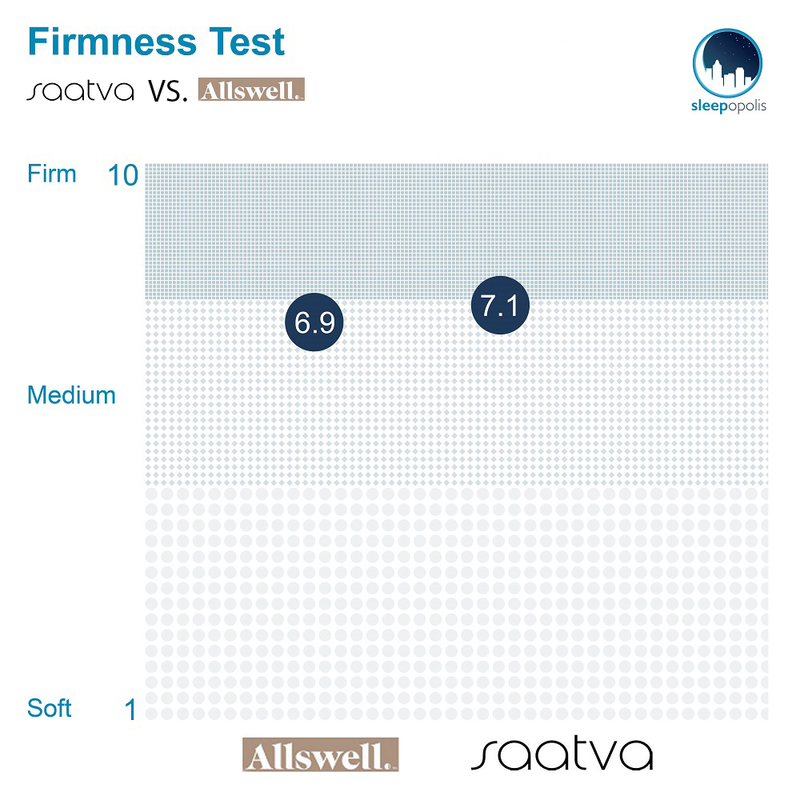 While I’d assume that these differences would apply across the brands’ various models, I can’t definitively say how the softer Allswell would compare to the softer Saatva, for example. The first thing to figure out is what kind of feel you’re after. If you want to feel like you’re sleeping on top of your bed, I’d say go with the Saatva. However, if you prefer sinking into your mattress a little bit, you’ll be more satisfied with the Allswell. The second comes down to bounce. Though you’ll likely experience some pleasant lift from both of these beds, if you need something really bouncy, consider the Saatva. And finally, let’s talk about price. While there isn’t a big difference here, the Saatva is slightly more expensive than the Allswell, though both make for a terrific value buy. 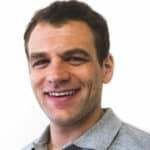 To get even more specific about my recommendations, I’m going to list the great aspects of both models as well as some of their specific pros and cons. Either one of these beds would make a wonderful pick for sleepers who want to feel positioned on top of the structure. They’d also be great for anyone in need of some firm support as their individual coil systems do an excellent job of lifting the sleeper up. And finally, these mattresses would also be awesome for anyone who needs a little bounce to their bed. A big plus for the Allswell is its memory foam top layer. If you want a hybrid but also want the pressure relief of the classic material, this could be a solid bed for you. It also comes compressed in a box, which is another advantage it has over the Saatva. If you’re looking to get in on the online-only mattress craze but still like the feel of a traditional innerspring, the Saatva could just be the bed of your dreams. And if you can’t quite land on what kind of firmness you want, the multiple options in the Saatva line make it easy to find the perfect fit for you. Given both of these mattresses’ relatively firm support, I wouldn’t necessarily recommend them for side sleepers or anyone who prefers a “softer” bed. I’d also say that if you’re on the hunt for some deep body contouring, neither one of these beds is really going to fit the bill. Well that does it for this Allswell/Saatva comparison! If you have any more questions or comments, please feel free to leave a message on the video.